Meet the Greater Adjutant. 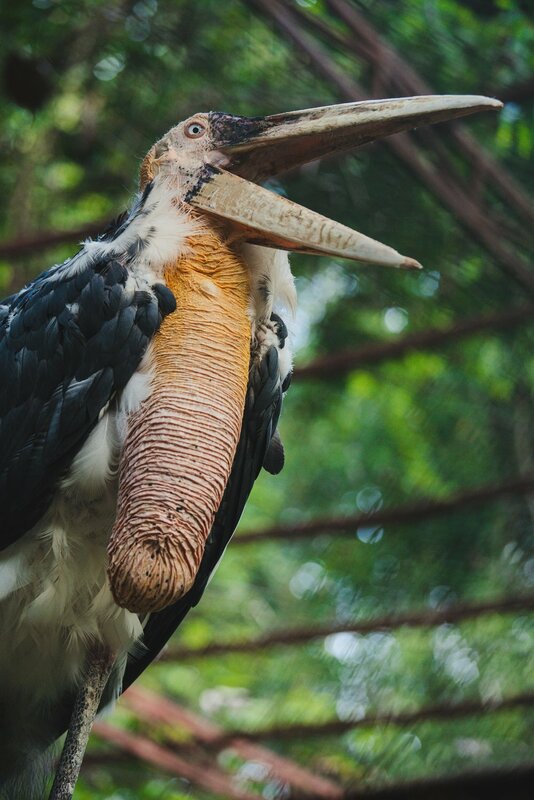 Granted, it’s a strange looking bird, but it also happens to be one of my favorite resident here at the Angkor Center for Conservation of Biodiversity. These birds can reach a height of upwards of 1 meter 50 and have a pink pendulous neck-pouch. Once very common in Asia, the greater adjutant population has steadily declined and today, only two breeding populations remain: one in India, and the other here in Cambodia. I'd like to draw your attention to this pink pouch that hangs down from the bird’s neck. Both males and females have it, and you might be wondering what on earth does this big hanging sack does. Well, to put it simply, we don’t know. The scientific community still has no idea what function this pendulous neck-pouch serves, and I think that’s fascinating. You would think that with our modern technologies we would have enabled us to find out, yet, the biological world proves to still be full of mysteries. Meet the Green Peafowl, cousin of the Indian Peafowl-the ones running around in fancy European parks-the Green Peafowl is actually quite rare and is found mostly in the tropical forests of Southeast Asia. This species is listed as endangered by the IUCN red list mostly due to the high rates of poaching experienced by these birds for both their meat and their beautiful, ornamental feathers. Little side fun fact: the word peafowl refers to the general name of the family of birds, while the word peacock only refers to male peafowls! On Sunday July 8th 2018 we had the pleasure of releasing three Rufous-winged buzzards (Butastur liventer) back into the wild along with two Lesser Adjutants (Leptoptilos javanicus) and a Changeable Hawk Eagle (Nisaetus cirrhatus). The birds were all released in the Dry Deciduous Forest, in Oddar Meanchey Province. The buzzards flew out of their boxes instantly and looked very much at home in this environment. Rare and elusive, the Giant Ibis (Thaumatibis gigantea) is one of the few critically endangered bird of Cambodia. Coincidentally also the national bird, the population is estimated at about 200 remaining individuals. At ACCB, the centre I work for, we take care of two giant ibises and every morning when I cook breakfast-I can see their inclosure from the sink-I realize I am looking at roughly 1% of their worldwide population which is a mind-blowing thought, but also a terrifying one. There is something so marvelously expressive about this female gibbon, something so proximate to our own way of being, us humans. I was watching her through the viewfinder of my camera a few weeks back, and it reminded me of the evolution of our own species. I imagined the lives of our ancestors, the ones that must have looked somewhere between me and her, and right there and then, once again, dedicating my life to conservation felt both essential and justified. Pileated gibbons are “believed to be experiencing a decline of more than 50% incorporating a time frame of three generations—45 years, for the period 1970-2015, due to rampant forest loss and loss of mature individuals due to hunting”(IUCN). Meet the endangered indochinese silvered langur (Trachypithecus germaini). This gem of mother nature is believed to have undergone a decline exceeding 50% over the past 36 years and even though it has a widespread range throughout South-East Asia, it is now very rare in the forests it used to inhabit. Major threats? Poaching for bush meat and use in traditional medicine, the pet trade and the enormous habitat loss due to recent expansion of agriculture. On the bright side, organizations such as Wildlife Alliance and Conservation International are tirelessly working to combat the illegal pet trade. Always a piece of blue sky above the clouds. Almost half of all species of turtles and tortoises worldwide are threatened. Turtles are an evolutionary very successful group and have inhabited the earth for the last 220 million years. Now, in only a few decades, the human species has pushed many of them towards the brink of extinction. One big reason is habitat loss: worldwide wetlands are drained for urbanization, forests succumb to legal and illegal logging, nesting beaches are destroyed for sand dredging or touristically exploited, and the environment is polluted with plastic and pesticides. Additionally, millions and millions of turtles are captured for grinding their shells into traditional remedies, eating them as a luxury meal or to keeping them as pets or status symbols. Turtle conservation is one of our main focus areas at ACCB . We currently take care of more than 400 individuals of 7 species. Many of them were rescued or confiscated from the illegal trade. At ACCB they are being rehabilitated and prepared for their future release into protected areas or incorporated to one of our conservation breeding programs.